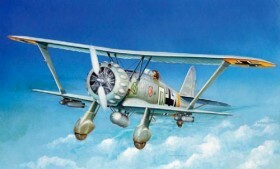 The HS-123 attack biplane was built for the renascent German air force during the 30s following a revision of the strict limitations placed on the German armed forces by the victors of the First World War. A typical biplane of that epoch, the HS-123 combined good manoeuvrability with a simple, tough airframe. It was first used during the Spanish Civil war to support frontline troops; in the Second World War it was used to support infantry on the eastern front until, quite simply, there were no more left.